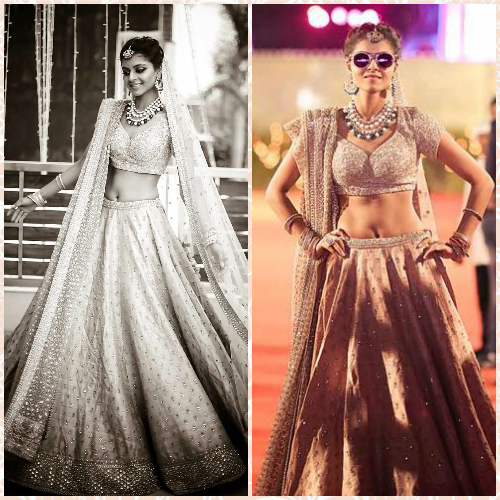 10 Brides Who Wore *Stunning* But Not-Too-Heavy Lehengas! 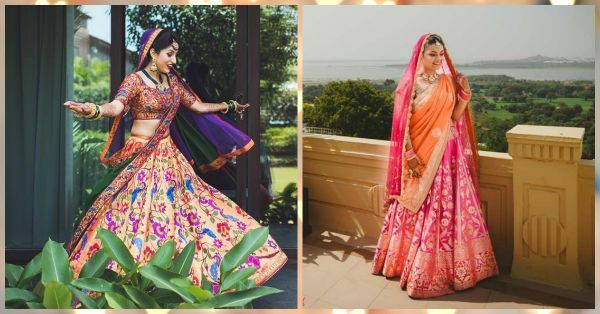 With the sun shining bright and the temperature soaring with every passing day, there is no doubt that our brides-to-be are having a hard time finalising their bridal lehenga. A heavy lehenga in this season is a big NO NO. And if you believe that you have to wear something extremely elaborate to look like a bride, then you’re mistaken. And who better than our real brides to drive the point home. 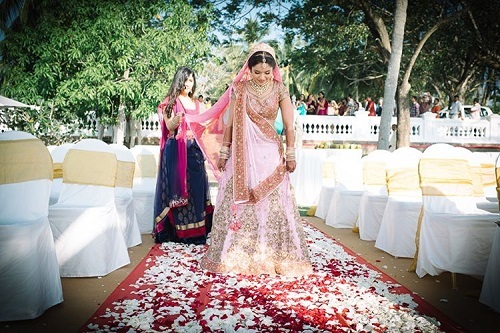 Take a look at 10 beautiful brides who wore lightweight lehengas and looked oh-so-gorgeous. Image: WeddingNama on Instagram This is the prettiest lehenga we’ve seen in a while. 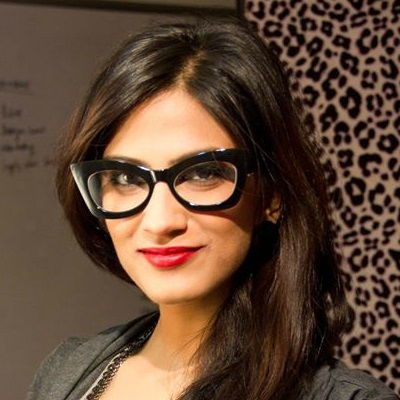 And who better than bride Mitali to show us that ‘bridal’ does not always mean heavy. A beautiful brocade lehenga with resham threadwork, we love the colours of this exquisite bridal outfit. 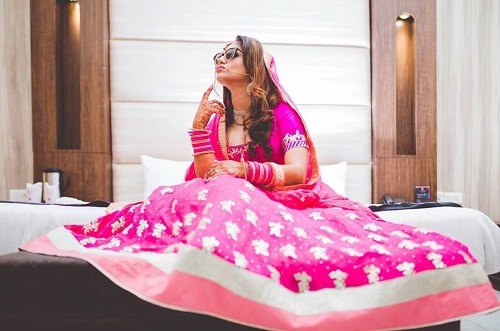 Image: Navdeep Soni on Instagram A gorgeous combination of pink and orange, this benarasi lehenga is giving us some major wedding fashion goals. Both the dupattas are kept light and the outfit sure looks very elegant. Perfect for your day wedding. 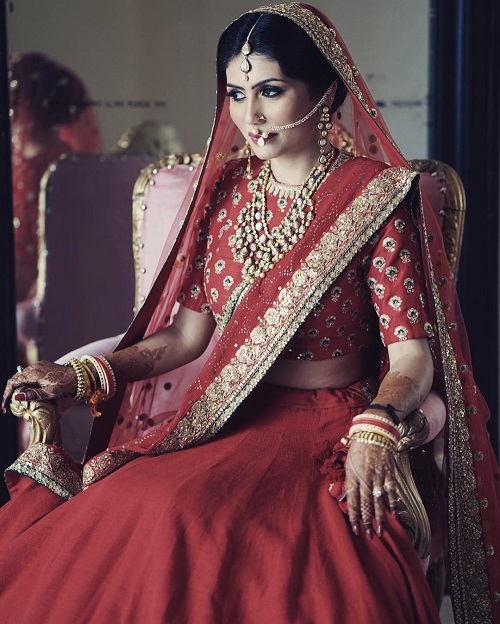 Image: Artfoto Studios on Instagram Bride Henna proves that red does not always make your outfit look extremely heavy. While the blouse features beautiful booti work, the lehenga skirt is kept plain. Both the net dupattas too have minimal thread work. Don’t you think she looks stunning?! 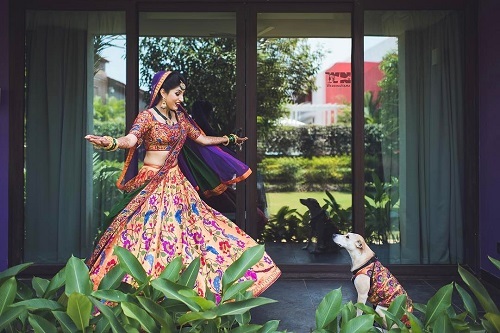 Image: Fotowalle on Instagram God, we can’t take our eyes off bride Rijuta. This Anita Dongre creation has made it to almost all our favorite lists and it truly is worth all the praise. A blue and beige lehenga with gota patti work, this is such a refreshing and beautiful bridal picture. 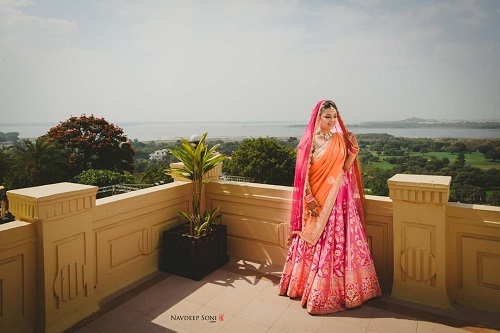 Image: Rishabh Agarwal Photography Not red, not pink, opt for a peach lehenga for your wedding day. 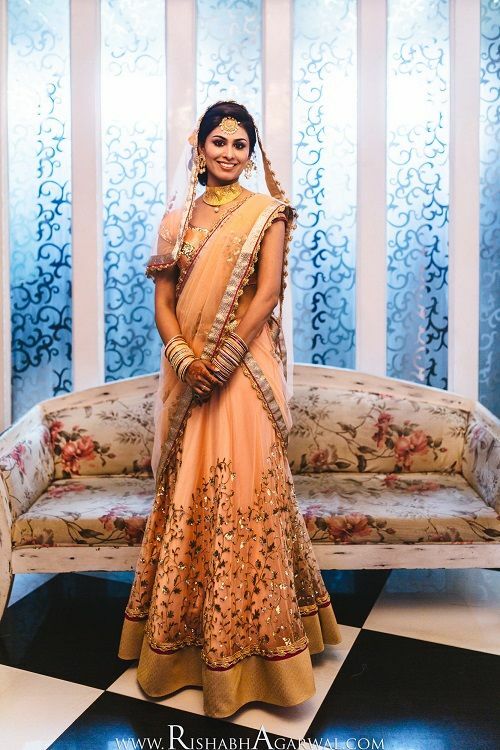 Bride Tricia wore a stunning peach lehenga featuring delicate gold work. Peach is one colour that really does flatter the Indian skin tone and the bride’s gold jewellery too blends with it so beautifully. Image: Navdeep Soni on Instagram A subtle and delicate Neeta Lulla lehenga, we love the blush pink colour of this one. It gives out such a princessy vibe! We love it when brides experiment with newer, fresher colours for D-day and we sure are crushing big time on this one. 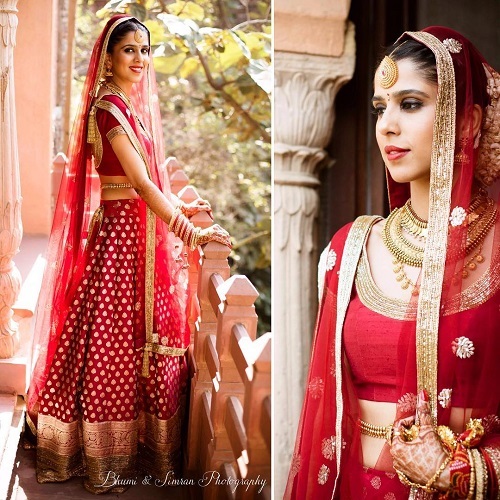 Image: Bhumi & Simran Photography on Instagram No heavy embroideries or blingy embellishments and yet this red banarasi Manish Malhotra creation made us fall in love with it. A perfect example for the bride who wants to keep it nice and subtle and red! 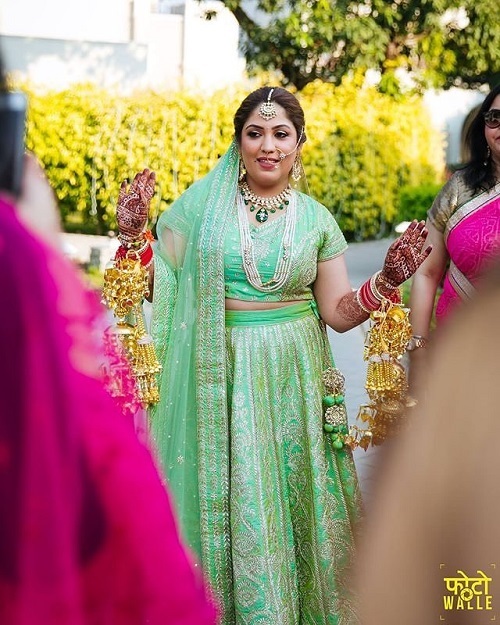 Image: Fotowalle on Instagram For her morning wedding, the bride chose a pretty mint green lehenga and we have to say that she looks amazing! Subtle silver embroidery and matching jewellery completed her fresh and fabulous look. We love it! Image: Morvi Images on Instagram A blush pink lehenga with scattered booti work - one look at this lehenga and we’re in love! While the blouse features lots of sequins, the skirt and dupatta are kept light to balance out the look. This is one lehenga that you can wear over and over again. Image: Mahima Bhatia Photography on Instagram Kala chashma and that pout, if that’s not swag then what is?! The bride’s lehenga features minimal silver work but the vibrant pink colour adds all the extra oomph to this look.